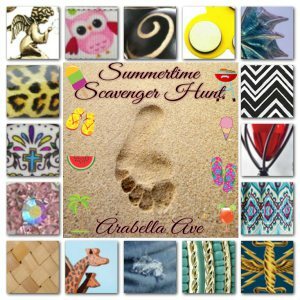 Teresa Winkles won Arabella Ave’s Scavenger Hunt! She found 15 out of 16! Good Work Girl! Thanks for Playing 🙂 Teresa has won $15 Off her next order! That’s pretty Cool! your answers or you’ll give them away!! You can send the full picture or the item #. The player with the most correct answers by noon on Monday, May 25, wins the game. get up to $16 off! You can’t win if you don’t play so Come On!